For many people step dancing is associated mainly with the Irish step-dance stage shows, Riverdance and Lord of the Dance, which assisted both in promoting the dance form and in placing Ireland globally. But, in this book, Catherine Foley illustrates that the practice and contexts of step dancing are much more complicated and fluid. Tracing the trajectory of step dancing in Ireland, she tells its story from roots in eighteenth-century Ireland to its diverse cultural manifestations today. She examines the interrelationships between step dancing and the changing historical and cultural contexts of colonialism, nationalism, postcolonialism and globalization, and shows that step dancing is a powerful tool of embodiment and meaning that can provoke important questions relating to culture and identity through the bodies of those who perform it. Focusing on the rural European region of North Kerry in the south-west of Ireland, Catherine Foley examines three step-dance practices: one, the rural Molyneaux step-dance practice, representing the end of a relatively long-lived system of teaching by itinerant dancing masters in the region; two, RinceoirÃ­ na RÃ­ochta, a dance school representative of the urbanized staged, competition orientated practice, cultivated by the cultural nationalist movement, the Gaelic League, established at the end of the nineteenth century, and practised today both in Ireland and abroad; and three, the stylized, commoditized, folk-theatrical practice of Siamsa TÃ­re, the National Folk Theatre of Ireland, established in North Kerry in the 1970s. 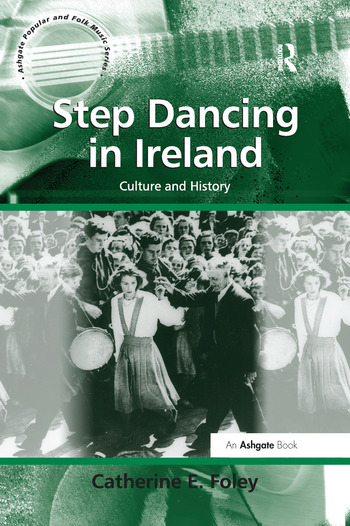 Written from an ethnochoreological perspective, Catherine Foley provides a rich historical and ethnographic account of step dancing, step dancers and cultural institutions in Ireland. Catherine E. Foley is a lecturer at the University of Limerick, Ireland; she is also a dancer, musician and ethnochoreologist. She is the Founding Course Director of both the MA in Ethnochoreology and the MA in Irish Traditional Dance Performance programmes at the Irish World Academy of Music and Dance, University of Limerick. She also supervises doctoral research in dance at the Academy. Catherine is Founding Chair Emerita of the international society, Dance Research Forum Ireland, and is Founding Director of the National Dance Archive of Ireland. She is also a qualified Irish step dance teacher. Catherine has published in international journals including Dance Research, Dance Research Journal, and New Hibernia Review and has contributed many chapters to books including Dance Structures: Perspectives on the Analysis of Human Movement (eds Adrienne L. Kaeppler and Elsie Ivancich Dunin) and Ancestral Imprints: Histories of Irish Traditional Music and Dance (ed. Thérèse Smith); she has also contributed articles to the International Encyclopedia of Dance, The Companion to Irish Traditional Music, and the Encyclopedia of Music in Ireland. Catherine choreographed The Sionna Set Dance (2005), a newly commissioned set dance, published in 2007 and also published her book and DVD, Irish Traditional Step Dancing in North Kerry: a Contextual and Structural Analysis, in 2012. She gives guest lectures, performances and dance workshops both within Ireland and further afield.